Although the D ring of Saturn is so thin that it’s barely noticeable compared to the rest of the ring system, it still displays structures seen in other Saturnian rings. Here the spiral structures in the D ring are on display. The D ring spirals, discovered in Cassini images, are believed to be due to a warp in the ring created in the early 1980s. The precise mechanism remains the subject of scientific debate. Over the course of the Cassini mission, scientists have been able to observe the spiral winding ever more tightly as it evolves. For more about the spiral, see PIA12820 and PIA08325. 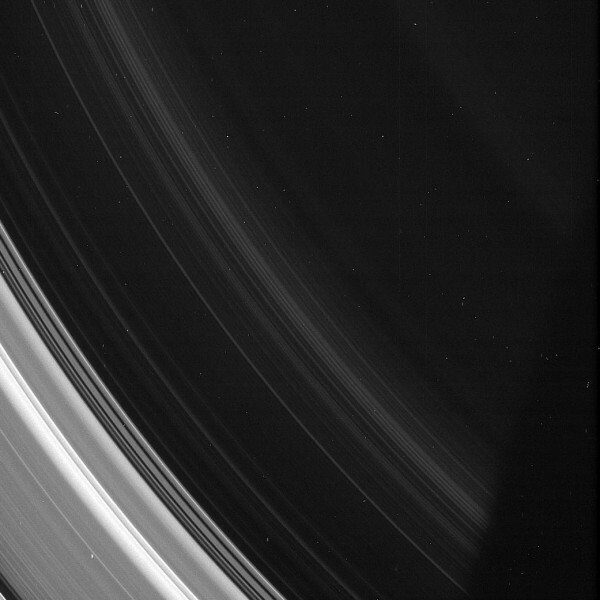 This view looks toward the sunlit side of the rings from about 22 degrees above the ringplane. The image was taken in visible light with the Cassini spacecraft narrow-angle camera on July 6, 2013. The view was acquired at a distance of approximately 350,000 miles (563,000 kilometers) from Saturn and at a Sun-Saturn-spacecraft, or phase, angle of 131 degrees. Image scale is 2.1 miles (3.4 kilometers) per pixel. For more information about the Cassini-Huygens mission visit http://saturn.jpl.nasa.gov or http://www.nasa.gov/cassini. The Cassini imaging team homepage is at http://ciclops.org .